I'm a husband, a father, a blogger and a runner. I play my music in the Texas sun. This is the story of my running adventures, marathons and ultra marathons on road and trail, and the people I've met who make it all worthwhile. The video clip above is from a Welsh band called the Blims. The song - Sidesteps and Sideburns - was a hit back in March when the Wales rugby team were chasing a Grand Slam (they subsequently beat France in a tight and tense game to complete the clean sweep and secure a third Grand Slam in eight years - both Gavin and myself got up at 4:30am to cheer them on from Austin). It is a catchy song which I have played a lot, and both Gavin and Dylan love it, sing along with it and regularly request it (Gavin has informed me that when he grows up he wants to play rugby for Wales, and if he can't get in the team he'll play for the USA). The visuals are a tribute to both the legendary Wales team of the 70s and the current squad, interspersed with the everyday people and places of Wales. So the other day we decided to find some of the more scenic locations that featured in the video. The result was a wonderful drive up the Rhondda valley. We climbed up through old miners villages and little hamlets, winding through the mountain roads until we emerged at the heads of the valley. That really brought me back to my roots. There is a word in Welsh - Hiraeth - for which there is no English translation. The closest I can get is a yearning for home, and it's something you don't appreciate until you move away. Maybe it's a memory of a Country that, even though it's changed much since I left, and even though I live quite happily 5000 miles away, somehow still feels like home. A few miles up the Neath valley is the small village of Cwmgwrach, which in English translates to "Valley of the Witch". Nobody knows exactly how it got its name, but it goes back to at least the 9th century and locals are very proud of their witchy heritage. 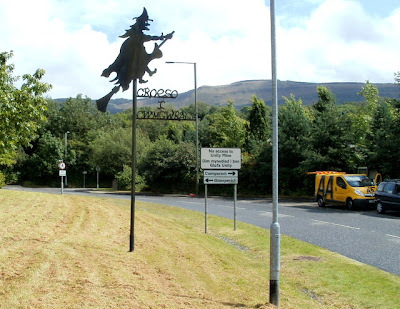 It is incorporated on the badges of the local school and rugby team, as well as this super cool road sign ("Croeso i Cwmgwrach" is Welsh for "Welcome to the Valley of the Witch"). I love the warmth, quirkiness and humor of my Welsh heritage - these unexpected gems can be found everywhere. Interestingly, Australian prime minister Julia Gillard hails from Cwmgwrach. We were passing through Cwmgwrach on our way to the village of Pontneddfechan to visit the Sgwd Gwladus waterfall - part of waterfall country. On our way, we stopped at the Cefn Coed colliery museum in the village of Crynant. This was a super cool museum in what was a working coal mine from the 1920s to 1968 - during its working life it was nicknamed "the slaughterhouse". The staff there were super friendly and teased Gavin and Dylan mercilessly (though the Gavster gave as good as he got, and Dylan just pretended to be Iron Man and blasted them). We got to go undergound, visited the boiler room and saw the original 1927 steam powered winding engine. But what made my dad's day was the restored gas powered tram, which we did not expect to find, and is believed to be the only remaining example in the world. The Neath gas trams ran from the late 19th century until the 1920s, and the story behind this exhibit is almost as interesting as the tram itself. After it was decommissioned, an enterprising local from Briton Ferry bought one of the trams, brought it to his back yard and converted it to a garden shed. It was discovered by the Neath antiquarian society in the 1980s and lovingly restored before finding a permanent home at the museum. My dad was excited because his uncle was involved in bringing the gas trams to Neath. We enjoyed exploring the tram - sitting inside and on the top deck where the backs of the seats could be shifted from one side to another so you could sit facing either way. Eventually we made it to Pontneddfechan ("Bridge over the River Neath" in English). Dylan had fallen asleep, so Nancy, Gavin and I made the 3 mile hike to the Sgwd Gwladus (Gwladus Falls) while my dad stayed with him. As with most things in Wales, there is a legend behind the name. I am a sucker for legends, and here is the story behind this one. Gwladus was said to be the beautiful daughter of Brychan of Brycheiniog, a 5th century Welsh prince. She fell in love with a young man called Einion, but their love was doomed. Both lovers are immortalized as waterfalls, and the legend goes that although Gwladus and Einion could never be together in life, their spirits flow together for all eternity, pouring over the rocks and merging in the pool below. The hike to the falls is beautiful and secluded, and well worth the time. I have vivid recollections of getting in trouble with my dad as a kid for jumping off the top into the pool below. Looking at the falls and pool now, I can well understand why. Did I really once jump off the top of that? My parents looked after the boys a few days ago so Nancy and myself could catch a train and spend the day in Cardiff (capitol city of Wales). There were a group of girls sitting opposite us on the train, headed up to visit the campus of the University of Wales, and it occurred to me that this coming year most of the people who start university would not have even been born when I graduated. Other than that, we had a great day in Cardiff. It was a lovely cool sunny morning and we walked our feet off exploring the city. Of course, the rain started in the afternoon, and by the time we caught the train home it was coming down in sheets. We didn't have a camera with us, so no pictures of Cardiff Castle, the bunch of lads wearing sombreros and drinking Fosters at Neath railway station at 9am, or the ridiculous pair of shoes that Nancy spotted. But we've been lucky to enjoy some sunshine this past week, and here are some other photos from the past few days. Is it a trick of the light, or is that sunshine? Despite the sun, the pool was really cold. During the course of the day, I pulled both boys into the pool. Yes, I really am that evil. In my defense, they were both in the process of trying to push me in - I just brought them with me. Gavin was really mad at me until I grabbed Dylan and pulled him in as well. Then he was happy. Tonna cemetery and the grave of my great great grandparents, William and Sarah Richards (on the right), and one of their sons (on the left). The ghostly figure in blue in the background is Dylan!!! When I was in Boston, I enjoyed exploring some of the old cemeteries in the heart of the city. What better way to discover the past that to visit the dead and give your regards to long ago. I loved the gothic architecture, but to be honest it was a little too touristy. So one of the things I was looking forward to on our Wales trip was exploring the local graveyards in their natural setting, especially since my dad has been doing a lot of research on our family history. I wasn't disappointed. "1823 To Record MURDER this stone was erected over the body of Margaret Williams, aged 26, a native of Carmarthenshire, living in service in this parish, who was found dead with marks of violence on her person in a ditch on the marsh below this churchyard on the morning of Sunday the fourteenth of July 1822. Although the savage murderer escaped for a season the detection of man yet God hath set his mark upon him either for time or eternity and the cry of blood will assuredly pursue him to certain and terrible but righteous judgement." Somewhat creepily, there were fresh flowers on the grave. And covered up our names". Happy 4th of July. Of course, here in the UK nobody is really aware it's a National holiday in the US. But as it also happens to be my birthday, we will go out tonight to celebrate the fact that I have 365 more days where my age starts with the number 3. It's been raining here non-stop all week. Cold, pouring, drenching rain. Apparently it's been the wettest June on record, and it's extending into July. But that hasn't stopped the Gavster and I from going swimming in the sea, and it hasn't stopped me running every day. I haven't been going far, only about 4 to 5 miles, but it's been all hills. For the first 2 miles, I'll run with Nancy and run backwards up a hill I have taken to calling the "Quad Masher" (back when I was good at running hills I would regularly train by running uphill repeats backwards, and it made a big difference). Then we'll run the forest trail around the lake at the top and head back down. We'll complete a loop back to my parents house, and then I'll go back out and run it all again as a pace effort (running the hill facing forwards this time). My best for the 2 mile pace loop so far is 15:22 - not particularly fast, but I've been consistent on aching quads, and I'm starting to build base for the Fall and Winter marathons. Consistency has been something I've been missing for a long time, so this is good. And I'm loving the cool temperatures. What I'm reading: just finished "Forks over Knives" and am midway through "Finding Ultra" by Rich Roll. If you can get past the constant references to the "pay for" material and programs on his website, it's a remarkably frank and honest account of his battle with alcoholism and the transformation of his life through fitness and nutrition. Both books have made me think seriously about the health and performance benefits of a plant-based, non-dairy diet, and this is something I plan to experiment with when we get back to Austin. For my birthday, I have promised myself a top of the line Vitamix blender, and green smoothies may well become a regular menu item at Casa del Welshrunner. Scott Jurek's "Eat and Run", and Brendan Brazier's "Thrive Foods" are next up on my reading list. I doubt either will do anything to talk me out of trying a plant-based diet. Here are some photos of our recent watery adventures. Just descended the rock face to a secluded tidal beach at Porthcawl. I have gotten a lot of use out of my Boston jacket this trip (as have Nancy and Gavin). Pouring with rain, temperatures in the upper 40s, Gavin and I get ready to enjoy some rocking waves at Rest Bay, Porthcawl. Once you got past the initial cold, it really wasn't too bad. Lots of surfers in the background. Do you like my Welsh dragon swim trunks? There is a story behind this picture.We visited my uncle's house a few days ago. He has an unheated outdoor pool, and we all decided to brave it. The temperature was in the mid-50s, the pool a little less. I jumped in, and it was icy cold. But as I keep saying, I burn hot and I love the cold. I was interested in seeing who else in the family shared my werewolf tendencies. Gavin jumped in and didn't stay long. Dylan escaped from Nancy and launched himself in before even taking his shirt off. I caught him and managed to hold him out of the water until we could at least get his shirt off. Then he launched himself again. I caught him and decided to let him plunge right into the water to see what he did. He caught his breath for a second when the icy water hit him, then he laughed. We played around in the pool, and every time I asked if he was ready to get out, I got "a few more minutes daddy" from chattering lips. We outlasted everyone, and I was so proud to have identified the next generation of werewolf. We did succeed in getting him out a few times, only to have him escape and jump back in again!!! Here's Dylan in "corpse pose" after finally being dragged out and wrapped. And here are some other photos from our trip to rural West Wales.